it is not certain, though The Nikkei Asian Review reported that Xi hoped to come to India before the general elections in May. The Japanese publication said that if not in February, the visit could take place after the National People’s Congress in Beijing in March. The main rationale seems to “counter Washington’s increasingly antagonistic trade policy and aggressive Indo-Pacific diplomacy,” according to the Japanese newspaper. When asked about it, Hua Chunying, the Chinese Foreign Ministry spokesperson said, “I am not aware of what you said,” but she added that China and India were friendly neighbours. 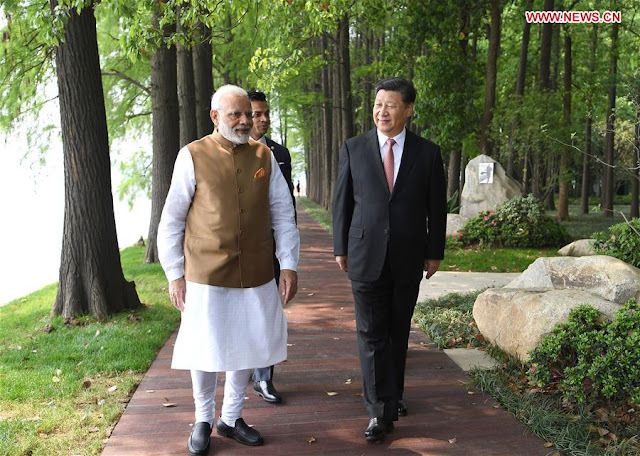 Why would Xi visit India so soon after the encounter of the two leaders in Wuhan in April 2018, which resulted in the famous ‘consensus’? The answer is simply because China is not in good shape, having been destabilized by President Trump and his tweets and facing unprecedented economic issues. The most telling sign has been the postponement, for more than three months now, of the Fourth Plenum of the Central Committee which traditionally discusses economic issues. Since beginning of October, China watchers have been expecting the Plenum to take place ‘soon’; weeks and months have passed and no Plenum. Why has the top leadership been unable to meet? The Plenum has not been held for different reasons: one is the grim economic situation which brings to the fore dissension, in particular to decide future priorities, among the leadership as well as between the Centre and the Provinces. Instead of a Plenum, the seven members of the Politburo’s Standing Committee met senior provincial and ministerial-level officials, during a ‘study session’ at the Central Party School in Beijing on January 21. They discussed ‘major risks’ facing the Communist Party of China (CPC). He urged the Party and the regional governments to pursue a holistic approach to national security in order to ensure the political stability of the regime. He mentioned the turbulent international situation and the complex and sensitive ‘surrounding environment’; ‘stability maintenance’ must be carried out vigorously, he said. China must protect itself against Black Swans and charging Gray Rhinos: “The CCP regime will likely face immense challenges from inside China and abroad.” Black Swan refers to an unforeseen occurrence with extreme consequences, while a Gray Rhino is a highly obvious threat which has been ignored. For Xiang Songzuo, a professor at the Renmin University School of Finance, wrote China’s GDP growth would only be 1.67 percent and not 6.5 percent in 2018. Xiang gave four reasons why China’s economy did so badly: first, the tightening of the government financial control caused shortage of capital supply; China’s stock market dropped 30 percent and lost US $1 trillion in value in 2018; the government’s inclination to eliminate private ownership and expand state owned companies which has greatly hurt private companies’ confidence and lastly, the trade war triggered by President Trump. All this may force Beijing to have a hard look at its priorities. India seems blissfully unaware that there could be a problem with Huawei; you will say. Five years ago Killi Kruparani, the MoS in the Ministry of Communications and IT admitted that an incident “about the alleged hacking of Bharat Sanchar Nigam Ltd (BSNL) network by Huawei … has come to notice”. After Wuhan, between friends, no such thing can happen! It is probably to make sure that India does not join the bandwagon of the China’s and Huawei’s detractors and to make sure that the Consensus last forever that Xi is planning to visit India. Shaky China needs friends; India is always ready. A word of caution is however necessary, Hindi-China bhai-bhai has not led anywhere in the past. This article China is forced to court India appeared in Mail Today.